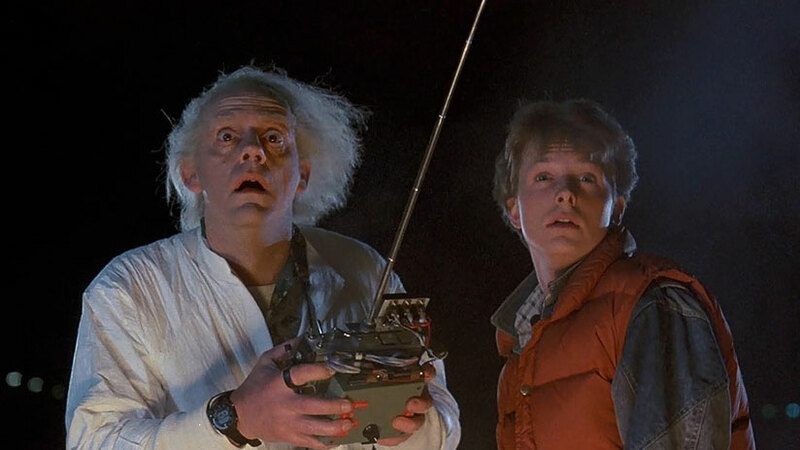 How do I talk about Back to the Future, my favorite movie of all time? I'm not entirely sure, so I'm just going to start typing and see what happens. Back to the Future (BTTF) came out in 1985. I was 9 years old and in the fourth grade. My highlight of that year was getting kicked off the bus for two weeks because myself and a friend of mine were using erasers to draw naked ladies into the backs of the seats in front of us. What I didn't realize at that time that a movie was coming out with the guy from Family Ties that would stick with me forever. I didn't see it in theaters, but I remember renting it from Flicks Video - one of the many mom/pop video stores that are a thing of the past, and a future employer of mine through high school. I popped in to my top-loading VCR, sat on the couch with the remote (that was wired and plugged into the VCR) and started watching. Two things stuck with me pretty quickly. Is that Doc really the guy from Taxi? I knew that there was an awesome car, that it traveled back in time, and that this kid needed the help of a friend that didn't know him yet to get back to his time - and save his own existence by making sure his parents got back together. I remember really enjoying it the first time I saw it - but I wasn't quite obsessed with the movie. I'd watch it a bunch more times over the years, whenever it was on HBO or the basic cable movie of the week, but I still didn't own it. Of course, back then you didn't really own VHS movies - you either dubbed them using two VCR's or you recorded them off of TV. I was still a pretty young kid, so it wasn't until Parts II and III were released back-to-back summers that I really started getting into this movie. I'll never forget walking into the BJ's with my parents one night and seeing the box set with all 3 movies PLUS a bonus “Secrets of…” tape hosted by Kirk Cameron. I'd seen the special on television before part 3 came out, but I loved behind the scenes movies stuff so I was psyched to be able to watch it again - if my parents let me get it. Well, I must have given them a strong enough case to why buying these movies would change my life, and maybe they didn't change my life in a big way, but they sure changed my sleeping habits. For the next 5-6 years, through college, there would rarely be a night that I did not fall asleep without one of the Back to the Future movies playing in my VCR. That is the time when I really became obsessed with the movie. I could play it out in my head. I could recite the dialogue. Hell, the following mornings I would sit in the shower and try to remember where I left off just so I could start back up in the same spot that night. A couple years ago they finally released the trilogy on DVD and I got the box set for Christmas. I felt like I was back in school again watching these movies over the first time. Absorbing all the commentary and the behind-the-scenes extras. Imagine your favorite movie of all time. Now imagine that you were given a treasure chest of goodies about that movie - that's how it felt having that DVD set. Of course, a lot has changed since I was the kid with the VCR. When I got the box set gift, I was already married and - well, my wife likes to sleep in total darkness and silence - so falling asleep with them wasn't quite in the cards. But my wife did appreciate my love for Back to the Future in two ways. First, the BTTF Overture was the song played at our wedding reception while they announced the bridal party. And second, with her bad back and the inability to go on most amusement park rides, she sat for almost an hour while I stood in line to go on the Back to the Future ride in Universal Studies Orlando - on our honeymoon. So, falling asleep in the dark/quiet - I can give her that. I just realized that I didn't really do a post about Back to the Future - but more a post about what Back to the Future means to me. It means magic. It means childhood. It means smiling. Great Scott! I love this movie!